In a post on Minimum Shift Keying (MSK), we had discussed that MSK uses two frequencies which are separated by and phase discontinuity is avoided in symbol boundaries. In that post, we had discussed MSK as a continuous phase transmit signal and showed that phase changes through 0, 90, 180 and 270 degrees. In this post, we will discuss MSK transmission as a variant of offset-QPSK technique. Further, we will discuss the receiver structure and show that bit error rate with coherent demodulation of MSK (using time) is equivalent to that of BPSK modulation. The channel assumed is AWGN. a) Consider a 8 bit sequence which is BPSK modulated as [+1, +1, -1, -1, -1, +1, +1 , +1] having symbol duration of . b) The same sequence can be sent over QPSK modulation, where even bits are send on I-arm and the odd bits are send over Q-arm. To keep the same data rate, the bits on the I/Q arm are send for symbol periods. c) Now, a variant of QPSK called offset-QPSK (O-QPSK) can be generated by having a relative delay between the I-arm and Q-arm by symbol period . Note: The advantage of O-QPSK is that phase of the signal can jump at a maximum of only 90 degrees (when compared to 180 degrees in QPSK). Having a smaller phase jump ensures that the spectrum of the waveform is cleaner even when there are distortions in the transmitter. d) Researchers have found that they can make the phase transitions zero, if rectangular pulse shapes used in O-QPSK are replaced by sinusoidal pulse shapes i.e by using and on the I and Q arm respectively. This is also known as Minimum Shift Keying (MSK) ! are the odd pulse sequence (send on the Q arm). We can see that MSK can indeed be visualized as a form of frequency shift keying (FSK), where the two frequencies are and . (a) Generate random binary sequence of +1’s and -1’s. (j) Repeat for multiple values of and plot the simulation and theoretical results. 1./ The BER with MSK is identical to BER with BPSK modulation. This is because MSK demodulation in the above simulation is performed by integrating the received symbol over time . 2./ Note that it is indeed possible to demodulate MSK by observing only over time and demodulate it as a FSK with two carriers at and . If such a demodulation is performed, then the BER with MSK will be 3dB poorer (comparable to FSK demodulation) when compared to BPSK modulation. 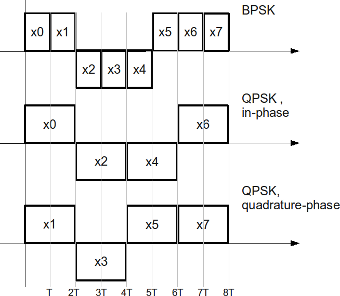 Simulating Minimum Shift Keying Transmitter Comparing BPSK, QPSK, 4PAM, 16QAM, 16PSK, 64QAM and 32PSK Symbol Error Rate (SER) for QPSK (4-QAM) modulation dspLog turns two! Happy Birthday! hi krishna i am doing project on msk ,plz help me how i can implepent the circuit diagram plz help me i am troble. 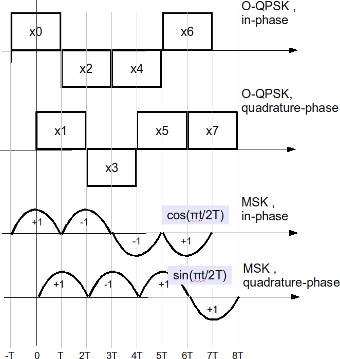 Hi, may i know how do you combine the quadrature and the in phase components to view frequency modulated MSK signal. thanks for your comments to msk modulation. I am busy to construct some software solutions for msk decoding. 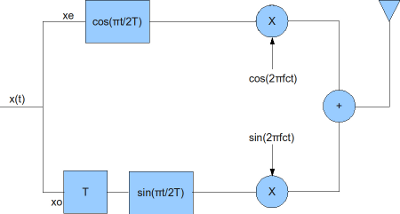 Looking at your receiver block diagram, the integration over 2T, is this an moving average, sum over 2T samples after every sample, or only every n*2T samples? this was the time intv i was using. The solution you gave me previously is fine for the exp msk version but doesnt work for this one. This equation is from your website. It works fine. How do i recover the signal from here. I’m still having a problem with evaluating the intergtration from 0 to 2T for the above signal. I am unable to write the precise code as I do not follow your code well. But am sure that you will be able to figure this out. Good luck. Just have one more basic question. i was just going thru the code you have written to evaluate MSK receiver. I just have a few questions regarding it. Im currently doing my final year project on this stuff so wondering if u cn help me understand the code better. I wanted to know what the last two lines of this is doing. And how u worked out 2*T+1:2*T:end-2*T.
i am comparing the DPSK and MSK modulations to different parameters. Can u please help me in two queries. 1. 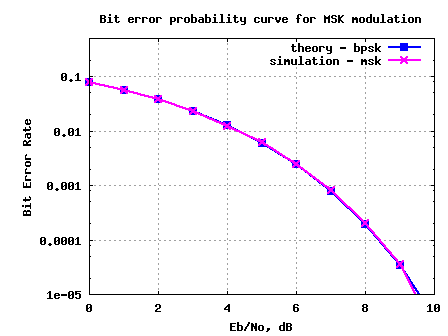 Is the error performance of BPSK and MSK are similar when MSK is done in sinusoidal wavedorm. 2. How can i extend both the modulations to complex systems such as OFDM. Can i get a M-file regarding that. 1. Is the error performance of BPSK and MSK are similar. hi Krishna, can you let me know when most probably you might have time to do that? I am really eager to see it. But anyways, thanks a lot in advance! I want to ask you something. Can you explain me why you divide by 20 the ratio Eb/N0 when you want want to add the noise to the signal. In my opinion, the ratio Eb/N0 is like ratio of energy and you have to divide it by 10 isn’t it ? Thanks for your work. I would like have a little more info about the matlab code. In MSK reciever, while retrieving data from the carrier, You have convolve with ones (1,8). Would you please explain, what exactly has been done with this convolution? Is it mandatory for OQPSK modulation? hi Krishna, is there any difference between above your implementation and ieee 802.15.4(zigbee) standard’s oqpsk with half-sine pulse shaping? thanks! @kos: Sorry, I have not looked into the Zigbee standard. they discuss it in this paper, if you have time can you look at it. My interest is the Figure 4 in that paper. They use also OQPSK but with half-sinusoidal pulse shaping…? I think that if you could modify your MSK transmitter a bit, it should be worked out. Plz, if you have time can you spend some time on this? Thanks a lot in advance!!! in this paper they show it in equation (2). Thanks a lot in advance! in section 6.5. Thanks a lot in advance!!! Thanks a lot for spending time on this issue!!! Hi Krishna, sorry for the fourth reply it is actually the copy of the previous three in one. When I first opened the firefox, it did not show my replies for that reason I thought my replies where deleted… Thanks in advance!!! hi Krishna, thanks for your post. do you have a code for ieee 802.14.5 Physical layer OQPSK with half sine pulse shaping? thanks a lot! @Riki: Sorry, I do not have. But are you sure that 802.14.5 uses half pulse shaping? I’m doing a project for connecting two systems through an MSK modulation scheme in Matlab. Coherent transmission and reception is OK but the reception incoherent does not, you could help me with some idea. @Jose Antonio: You are looking for an in-coherent demodulation of MSK, hmm. I cannot think of anything, but do you have some references? I will try to read up and tell you. @Wig: For the simulations in this post, I treated MSK as a variant of Offset QPSK and demodulated accordingly. Though I have not tried demodulation using the knowledge of phase transitions and corresponding Viterbi decoding, I believe BER should be matching with curve obtained for BPSK. Good luck in your algorithm explorations. @kos: I was looking at equations (1), (2) in the paper – and they look identical to the MSK waveform. Agree? Hi Krishna, thanks a lot for your reply. Can you modify msk-transmitter-receiver into one which will be resembling zigbee-transmitter-recevier? Thanks a lot in advance! @kos: Well, I have not written any post on Zigbee standards till date. Will keep that in the to-do list…. Hi Krishna, when probably you would have time to do that? I am really eager to see that. Anyways, thanks a lot for considering!